Pick up a copy of Waitrose Kitchen in store for even more delicious recipes and meal ideas. 1. Pat dry the chicken pieces and put in a medium bowl. Add the ginger, garlic, coriander, sumac, salt, lemon juice and 5 tbsp groundnut oil; stir together and set aside. 2. Crush the cardamom seeds in a pestle and mortar, then toast, with the rest of the spices, in a small frying pan for 1–2 minutes until fragrant. Add to the bowl. Rub the marinade into the chicken, cover and refrigerate for 2 hours or overnight. 3. To make the onion salsa, mix all the ingredients in a small bowl; set aside. 4. Preheat the oven to 180˚C, gas mark 4. Place a griddle pan on a high heat. Once red hot, cook the chicken pieces for 2 minutes on each side until brown. Transfer to an oven tray and finish off in the oven for 4–6 minutes, or until cooked through and no pink meat remains. Remove and allow to rest for a few minutes before cutting the chicken into 1cm-thick slices. Drizzle any remaining juices from the pan over the meat. 5. While the chicken is in the oven, wipe most of the residue from the griddle pan and add the remaining groundnut oil. Drizzle the pittas with a little water, just to moisten on the outside, and place in the pan for about a minute on each side, to warm up. Cut the pittas in two and open each half to make a pocket. 6. Just before serving, make the tahini sauce: mix the tahini paste with the lemon juice, 90ml water, garlic and a pinch of salt until completely smooth with a honey-like consistency (add a little water to loosen if necessary). 7. 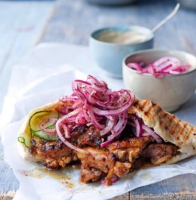 Spoon some tahini sauce, chicken and cucumber slices into each pitta half and top with the onion salsa. Serve at once. More info: 49.5g protein, 5.2g fibre.